It was a fantastic experience that we will all remember for the rest of our lives. 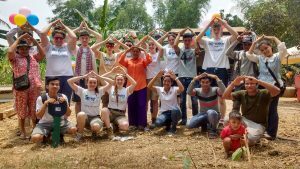 In 2018, a group of 25 students and teachers from The High School travelled to Cambodia to volunteer with Habitat for Humanity. 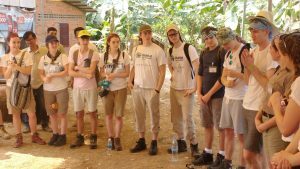 In this blog, students Siobhán Trimmer and Andrew Canning speak about their experience. 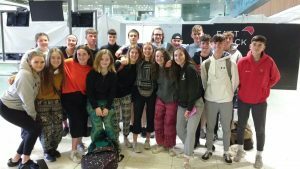 On the 23rd March, twenty Form 4 and 5 students along with five teachers gathered in Dublin Airport. After months of preparation, and with over €3,000 raised each, we were all excited to finally set off. After an exhausting 26 hours of travel, which included stops in Qatar and Bangkok, we finally arrived in Siem Reap, Cambodia. Cambodia is a small country in south-east Asia. It is a developing country with 17.7% of the population living below the poverty line. In 2013 at least 10 million Cambodians still lacked access to decent housing. Although it was early evening when we arrived, we were still hit by the intense heat and humidity. In recent years Cambodia has witnessed unimaginable violence and conflict. From 1975 to 1979, Cambodia was ruled by Pol Pot’s Khmer Rouge, a communist party established in order “to create a self-sufficient state”. To achieve this, they forcibly moved urban dwellers to rural areas, and hence boost agriculture production. They also executed any opposition or intellectuals (people with degrees). In four years, between 1 to 3 million Cambodians lost their lives, and much of Cambodia’s rich culture was lost. It took twenty years to end the fighting against Khmer Rouge supporters after the Khmer Rouge rule officially ended. Cambodia is still littered with landmines and unexploded bombs, a sharp reminder of this vicious history. After a three-hour bus ride to Battambang, we met with our host-coordinator, Paulie, for our orientation meeting. Paulie told us more about the Habitat projects going on in Cambodia and taught us some local greetings. The group waited with eager anticipation to start work the next day. We were woken up at 6:45 and after a breakfast of fried rice we set off on the short twenty-minute ride to the worksite. The journey to the work site was always an interesting experience, as the streets were alive with hustle and bustle. We congregated under a canopy and met with the three house partners. We went around in a circle, introducing ourselves (in very poor Khmer). We then shared our expectations for our time onsite. Each of the home partners then spoke a few words. Although it was harder to have to hear these speeches relayed through the translator, it was easy to see how grateful these women were. Everyone was struck by how excited and thankful they each were that we had arrived. We were split up to work on the three different sites. On Sites 1 and 2, the foundations and frame were already up for us. Work on these sites consisted of shaping bamboo sticks and then nailing them down to make the floor. We then had to dig a large hole for the septic tank and start building the bathroom. This included carrying bricks, mixing cement and laying bricks. We were lucky enough to be able to finish both Sites 1 and 2. On Site 3, we had to start from scratch. 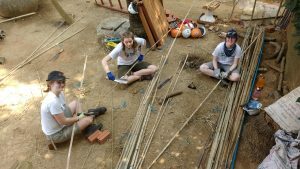 This meant we had to clean and smooth bamboo for the future flooring as well as having to dig seven large holes for the foundations and the septic tank. Due to the risk of flooding during monsoon season, our houses were to be built on concrete stilts. We had to mix cement and transfer it into moulds for the stilts. While the work was very physical and quite tiring, especially in the 35°C heat and up to 90% humidity, no one complained. I think everyone enjoyed seeing the progress we were making and found it very satisfying. 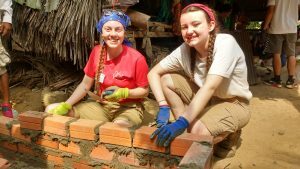 We usually arrived on the worksite at around 9 in the morning and worked up until 10:30. Then we took a small break, and the neighbours provided us with fruit and snacks. We were afforded the opportunity to taste some unusual, exotic fruits that do not even have a name in the English language. We then worked until 12, when we would all gather under the canopy on site 3 for lunch. Lunch was provided from a local restaurant and we tried new dishes and soups every day. After an hour catching up, we all went back to our respective sites. Apart from a small break at 2:30 we worked until 4, when we left for the hotel. During our work days we were able to interact with the home partners and locals. They worked alongside us in parts, and we shared lunch with them most days. During breaks, we could play with the children, and joke with their parents. On one of the days we were lucky enough to visit a nearby school to take part in Habitat’s hygiene project. 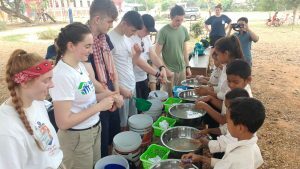 After a few speeches both by our group and the teachers of the local school, we took part in a demonstration of hand washing. We helped a small group of volunteers to pass out packs of stationery and nail clippers and showed the children how to cut their nails. After all of this we had time to play with the children. A large soccer match took place. The children zoomed around barefoot, following the ball intently, enjoying every moment of action. Other popular games were duck duck goose and catch. The children were delighted to see us and we all really enjoyed our brief time with them. We ended the morning dancing to some popular Cambodian music. Our last day on site was bittersweet. We spent the first hour or so finishing up any odd jobs around the site and blowing up balloons to decorate each site. We then had a dedication ceremony for each house. Each member who had worked on the site cut a small bit of the ribbon before the house partner finished it off. They were then presented with a key. Back on site 3, we performed an Irish dance, The Cha Cha slide, and sang Galway Girl. They then showed us some local Cambodian dancing. 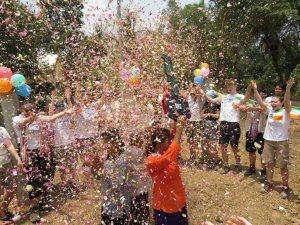 As tradition during the Khmer New Year, we threw baby powder over each other. After lunch, we travelled back to Siem Reap. It was a fantastic experience that we will all remember for the rest of our lives. On behalf of the team, we would like to thank Mr. Barry, Ms. Browne, Mr. Rankin, Ms. Deane, and Ms. Gray for organising the trip and making it the outstanding trip it was. We would also like to thank everyone who supported us in school, fundraising and preparing. It was a once-in-a-lifetime experience that we would recommend to anyone. 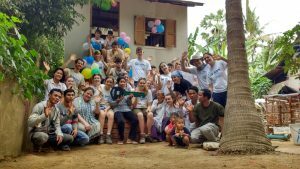 To learn about volunteering overseas with Habitat for Humanity, click here. To learn more about our Schools Programme, click here.